Jon and Tania are back and tracking down more ghosts, this time on the Mississippi River on an antique river-boat. With them are their mother and stepfather, producers of a hit TV show about "real-life" ghosts -- a topic no one on the crew seems to take all that seriously. But Tania has a gift -- she can see and communicate with ghosts, and this time she's in touch with the spirit of a riverboat captain who accidentally caused the boat to catch fire, and he's making trouble for everyone. Will Tania be able to help this troubled spirit find peace before disaster strikes again?In the Haunted series, a brother and sister travel with their parents’ ghost hunter TV show. In each book, the TV show researches a new ghost at a new location. 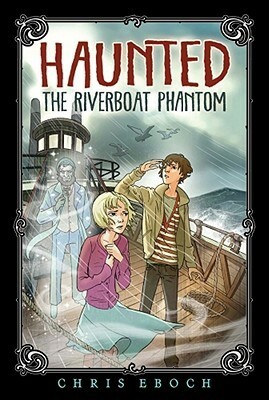 The Riverboat Phantom features a steamboat pilot still trying to prevent a long-ago disaster. Will it take another disaster to set him free? I won this one on first reads.Good book. I have family who can talk to, see and even hear spirits. This was definately a good book for our family. Even as an adult I enjoyed it. My teens will ejoy it as will even my younger neices and nephew.I will have to look into getting the rest of this series. Cute and fun reads. Ready to pick up the next one in this series. Took me a couple of hours to read the entire book.